At the top of the Ranked ladder? Details on Grandmaster and more inside. Hey everyone! Ed “SapMagic” Altorfer here, back again to talk about Ranked. With all the news around new tiers and placements, today we want to go in-depth on the very top of the Ranked ladder. 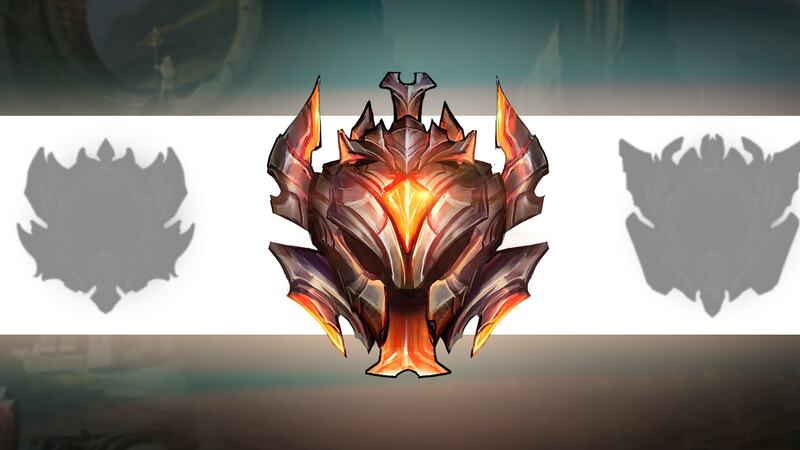 Specifically, we’re talking about how we landed on Grandmaster as the new tier between Master and Challenger, and a few improvements we’re making to how the ladder looks and feels in-client. We’ll also detail how position ranks will work at Master tier and above when they enter regional previews next year. If you’re Master or below, you might be worried that we’re just adding more distance between you and your Challenger dreams, but our goal is actually to kill a meme: the Diamond V scrub. No offense, but the meme exists because there’s a very real skill difference between the top and bottom of Diamond—and it turns out this is true within most of the top tiers. This difference in skill muddies the meaning of the entire tier as well as the achievement of reaching it. The issue slowly appeared over time because there are a lot more players in ranked now than when the system was created almost five years ago. As the number of players at the top—except for Challenger—grew, so did the skill bands within those tiers. This resulted in the top divisions of Diamond looking a lot more like Master tier than Diamond V.
We wanted to solve that problem because ranks like Diamond, Master, and Challenger should have a consistent meaning. Our first idea was to break Master into divisions and make it work more like the tiers below it. Ultimately, we didn’t feel like that would do enough to differentiate the tiers and make them feel meaningful; we were worried it could make a new Diamond V-style meme out of Master IV. With divisions, you’d get a more accurate rating but not an especially meaningful one, which would only end up solving half the problem. We decided to pursue a slightly different idea: Adding a new tier above Master called Grandmaster. This gives everyone at the top of Diamond and above a more accurate rank, and it makes the achievement feel more meaningful. 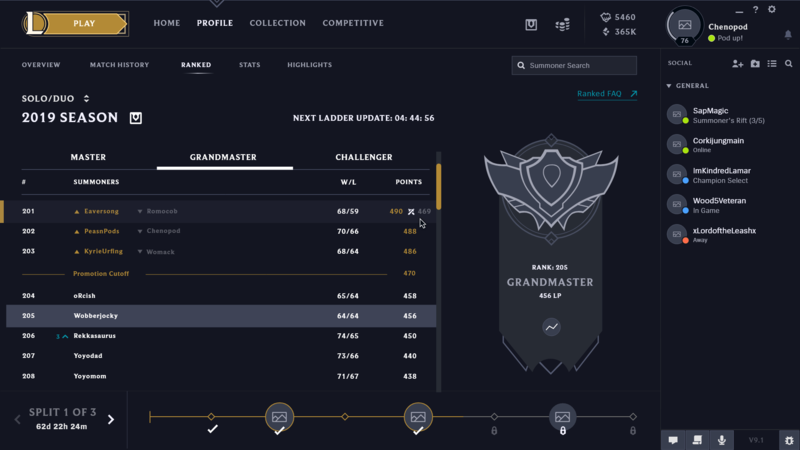 Competing at the top of the ladder should broadcast how great you are at League—adding Grandmaster gives the best players a chance to do exactly that. If you’re a Master-tier player today, you’re probably wondering if you’ll stay in Master or move up to Grandmaster. The answer is…both, kinda. Assuming you’re exactly as skilled as today, the best Master players will earn Grandmaster next year. One of the defining characteristics of the top of the ladder is running into the same players over and over. To embrace that, we’re making a change that we hope will encourage rivalries by telling you exactly whose spot you’re taking—or who is planning your proverbial demise. This extra touch should make games feel even more competitively charged when you’re on the cusp of promoting or demoting. We’re also planning to make some other quality of life improvements to the presentation of the ladder in the League client. Today, trying to figure out how close you are to promoting or demoting in the top tiers requires tedious tab-switching and scrolling, which makes something that should be clear into a major pain point. The revamped UI should make it much more clear how many points you need to keep or claim a spot. For regions previewing position ranks, you’re probably curious how that affects you and your rivals at the top of the ladder. In short, it doesn’t. As your ranks rise, the behind-the-scenes tethers that link your positions grow shorter and shorter. By the time you reach the top of the ladder, your MMRs are tightly-linked. Once you promote into Master, your position ranks collapse into a single rank much like today. We believe this is the right approach because the kinds of skills that get you to Challenger, like top-tier macro, expert vision control, and high mechanical execution, are often transferable between positions. It’s not universally true for every skill, but if you’re truly great at League, it’s hard to keep you down. We’re excited to see what competition at the top of the ladder looks like next year. As always, we’re open to your feedback, so let us know what you think and hit us up with your questions in the comments—or, better yet, click the Ask Riot button at the end of this post. Thanks for playing, and see you on the Rift—but not really, because my skill caps out somewhere between Gold and Platinum.